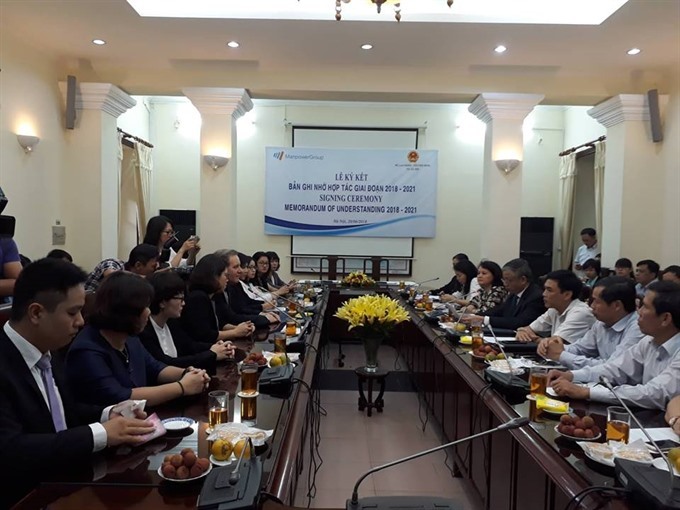 HÀ NỘI — The Ministry of Labour, Invalids, and Social Affairs (MOLISA) and ManpowerGroup have signed a Memorandum of Understanding (MoU) to prepare the Vietnamese workforce for the digital age. The MoU, which was signed on Wednesday, aims to provide strategic expertise in the period from 2019 to 2021 to help Việt Nam develop a skilled workforce and effective regulatory frameworks for the digital age. The MoU was signed by Simon Matthews, Country Manager of ManpowerGroup Vietnam, Thailand, and the Middle East, and Doãn Mậu Diệp, Deputy Minister of Labour, Invalids and Social Affairs. This is the fourth MoU between ManpowerGroup and MOLISA. Under the MoU, ManpowerGroup will develop skilled talent by improving the knowledge and professional experience of the local workforce to enable them to adapt to automation and digitisation. It will also promote the development of women’s roles and enhance their leadership skills under Industry 4.0. ManpowerGroup has also agreed to raise awareness about trends, employment and human resource development, and international commitments in the context of international integration and the industrial revolution 4.0. It will also provide information, analyses, and orientations on the labour market, as well as support to improve the market infrastructure.